HealthInvestor’s Power 50 celebrates and recognises the industry’s most influential leaders. 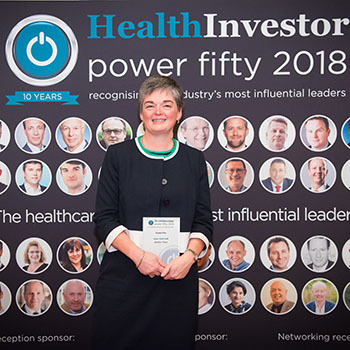 The Grand Prix is bestowed on the Power Fifty member who has had the “most impressive year”, decided by HealthInvestor UK readers, along with the Power Fifty themselves. At the helm of an organisation with more ‘Outstanding’ rated care homes than any other, Jane was recognised by her peers for her “breadth and depth of sector expertise”. The merger of Anchor and Hanover also caught attention, with one member of the Power Fifty describing Jane as “one of the rare individuals who manages to successfully and very genuinely combine the desire to improve society with a drive to commercial performance”. The announcement was made at an event hosted by deputy political editor for BBC News and presenter of Pienaar’s Politics on BBC Radio 5 Live, John Pienaar. For more information on HealthInvestor Power Fifty 2018, please visit www.healthinvestor.co.uk.